A North Carolina resident sits on his staircase earlier this week, staring into the water that surrounded his home after Florence hit Emerald Isle, N.C.
Flames consume an evacuated home in the Napa Valley wine region last October. California's Department of Insurance says the total insurance claims in 2017 were the highest on record — including nearly $12 billion over the final three months of the year. 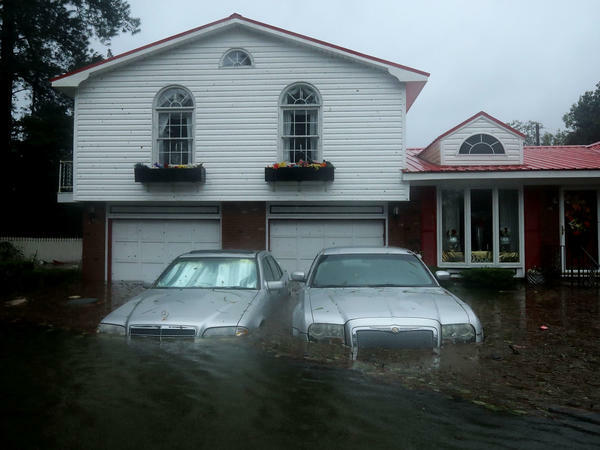 At a home not far from the Neuse River in New Bern, N.C., floodwaters last weekend overwhelmed the high-priced vehicles out front. According to consumer advocates, low-income homeowners stand to lose the most from changes expected in the insurance industry. When the floodwaters recede, residents will face some tough decisions about how — or even if — they can rebuild. It's likely that fewer than 10 percent of households hit by Florence have flood insurance, according to actuaries at Milliman, and others may discover their homeowners insurance policies cover less than they'd assumed. But Florence isn't a fluke. Scientists have predicted that climate change will continue to exacerbate massive storms, and that it will continue to cause conditions ripe for wildfires and other natural disasters. 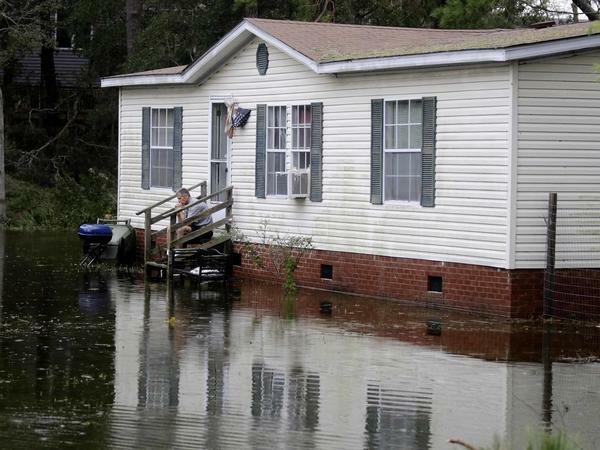 As the risks of these disasters grow, the insurance industry is adapting with them — and consumer advocates, regulators and insurance researchers alike fear that the brunt of the bills will increasingly fall on the shoulders of low-income homeowners. Munich Re has laid out the challenges of a changing climate. As one of the world's largest reinsurers, the company insures other insurers in cases of catastrophe, so it has good reason to keep track of catastrophes such as Florence. It has been doing so for nearly four decades. "When I look back to the 1980s, we recorded 200 to 300 events — catastrophe events — annually, and today we are close to about 1,000 events," says Munich Re's chief climatologist, Ernst Rauch, who has been doing this research for the reinsurer for 30 years. That means a lot of losses that insurers must be prepared to cover. Last year alone, it meant roughly $135 billion in insured losses — including a record amount in California, where wildfires drove nearly $12 billion in insurance claims in just a three-month span. That huge sum is just one reason why wildfires keep California Insurance Commissioner Dave Jones up at night. "The climate scientists tell us that we're going to continue to see temperatures rise, and that will contribute to more catastrophic weather-related events," Jones says. "In California, what this has meant is loss of life, loss of property, business interruption, community devastation associated with wildfires." It's Jones' job to be sure that insurance companies are ready to cover these losses. But it's also his job to protect the folks who actually suffer these losses. And that's becoming even harder these days, especially in areas that insurers consider risky for wildfires, such as Mendocino County, where California's biggest fire on record consumed an area the size of Houston earlier this year. Jones' office found that in these areas, complaints about price increases shot up from 2010 to 2016, the last year for which it has data. And across a two-year span, he saw a 15 percent increase in the number of homeowners in these regions who found that their insurer would not renew them at all. As a result, more homeowners have been turning to California's state-created insurer of last resort, the FAIR Plan, which can often be even pricier. Jones calls that plan his "canary in the coal mine," and he's watching it closely. 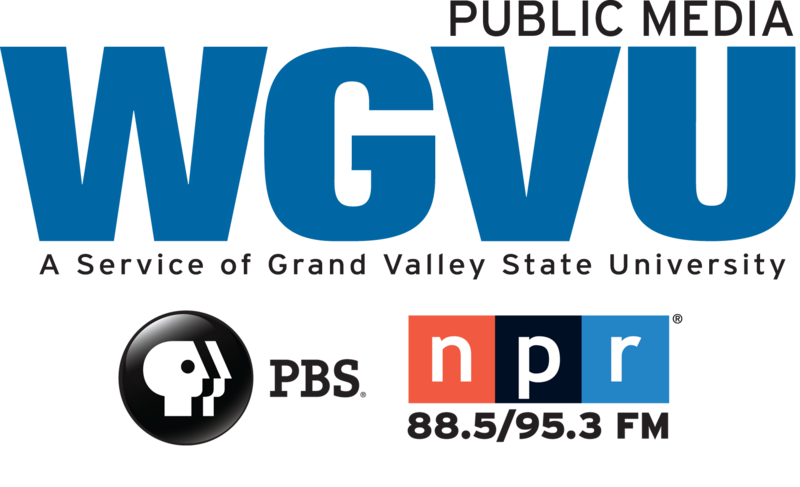 The numbers do not reflect a crisis yet — but still, he says, "it's a growing problem." "People are finding insurance, it's just that they're finding it increasingly challenging in some areas to find insurance," Jones explains. "And those areas which were traditionally thought to be of a lower risk are now being treated by the insurers as a higher risk." And the state expects this situation to get worse. 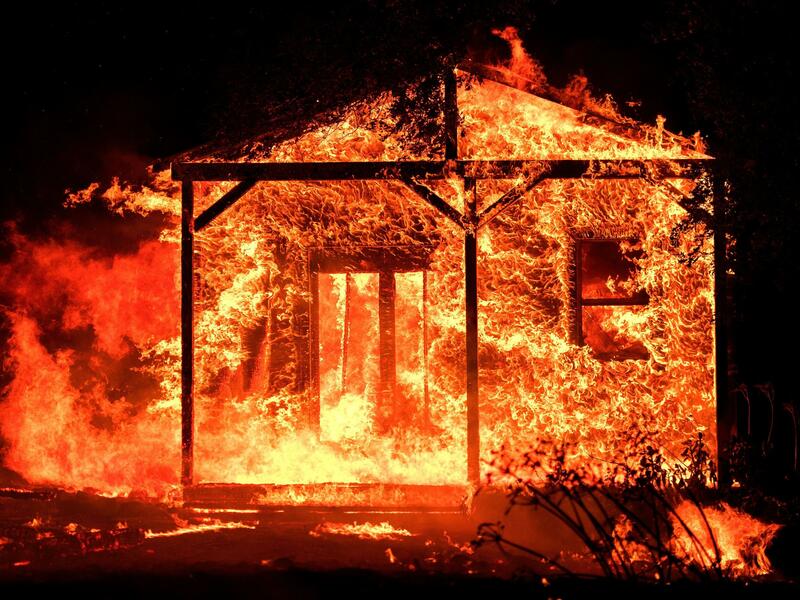 In California's latest climate assessment, officials predicted the area burned by wildfires will increase dramatically in the coming decades. It's not just California. Hurricanes, droughts, floods — with global temperatures expected to rise, consumer advocates expect insurance pains to rise with them. But looking ahead, that pain may not be evenly distributed. "The insurance companies will take care of themselves," says Bob Hunter, director of insurance for the Consumer Federation of America. He says these companies have come up with a variety of ways to handle the risks of climate change — from developing more accurate prediction models and relying on reinsurers such as Munich Re, to raising premiums or "hollowing out" policies by reducing their coverage. "Rich people can afford richer policies," Hunter says. "You have to pay a lot for that, but if your house gets destroyed, you're going to get totally rebuilt. But poorer people who can't afford that are going to buy slimmed down policies — some of them won't even know they're slimmed down until the event happens." "And then, the very poor will be priced out. Those are the people who will probably — not probably, will — get hurt the most," he says. That's a point voiced not just by advocates, but also by regulators and some researchers in the insurance industry. "If you think beyond the next 10, 20, 30 years, then climate change could play a major role when it comes to the issue of affordability or availability [of insurance] in certain areas," says Rauch, Munich Re's climatologist, who predicts these bills "will become, sooner or later, a social issue." "Because by the end of the day," he adds, "someone has to pay for the increasing risk caused by climate change." Families without flood insurance are wondering if they can rebuild after the flooding from Florence. For those who are covered by insurance, the price is growing, as are the risks. Here's NPR's Colin Dwyer. COLIN DWYER, BYLINE: Florence was a massive, wet monster, and an expensive one, too. Early estimates put the storm's price tag as high as $22 billion. But Florence is just one on a growing list of natural disasters recorded by Munich Re. The German-based company offers insurance for other insurers in case of catastrophe, so they have good reason to keep track. Ernst Rauch leads research on this stuff for Munich Re, and he's been doing it for three decades. ERNST RAUCH: When I look back to the 1980s, we recorded 200 to 300 events - catastrophe events annually. And today, we are close to about a thousand events. DWYER: That means a lot of losses insurers have to be prepared to cover - more than $130 billion worth last year alone. But these losses go beyond the balance sheet. DAVE JONES: Loss of life, community devastation. DWYER: That's Dave Jones, California's insurance commissioner. He's not too concerned about hurricanes. It's wildfires that keep him up at night. JONES: The climate scientists tell us that we're going to continue to see temperatures rise, and that will contribute to more catastrophic weather-related events. DWYER: You see, climate change is not just on the minds of insurers. It's also on the minds of the officials who regulate them, like Jones. JONES: In 2017, collectively, we had the highest insured losses on record associated with wildfires in the state's history. DWYER: It's his job to be sure that insurance companies can continue to cover these losses. But it's also his job to protect the folks who actually suffer those losses. And that's becoming even harder these days, especially in risky areas for wildfires, like Mendocino County, where California's biggest fire on record blazed earlier this year. He says complaints about price increases have shot up in these regions. And recently, he has seen a 15 percent increase in the number of homeowners who've found that their insurance company would not renew them at all. Now people are still finding insurance, but more residents are turning to a state-created program as a last resort, which can often be even pricier. JONES: And those areas that were traditionally thought to be of a lower risk are now being treated by the insurers as a higher risk. DWYER: And the state expects the situation to get worse. Officials predict the area burned by wildfires will increase dramatically in the coming decades. But it's not just California. Hurricanes, droughts, floods - with global temperatures expected to increase, consumer advocates expect these insurance pains to increase with them. And looking ahead, that pain may not be evenly distributed. BOB HUNTER: The insurance companies will take care of themselves. DWYER: Bob Hunter of the Consumer Federation of America. HUNTER: But poorer people who can't afford that are going to buy the slimmed-down policies. And then the very poor, of course, will be priced out. So those are the people who will probably - will, not probably - will get hurt the most. DWYER: That's a point voiced not just by advocates, but by regulators and researchers in the insurance industry. RAUCH: So it really becomes, sooner or later, a social issue. DWYER: That's Ernst Rauch of Munich Re again. RAUCH: By the end of the day, someone has to pay for the increasing risk caused by climate change. DWYER: And one thing is certain. Those bills will be expensive when they come due. Colin Dwyer, NPR News, New York. (SOUNDBITE OF WE CAME FROM THE NORTH'S "SEA'S DESCENT") Transcript provided by NPR, Copyright NPR.